The Low Down: Despite her feelings for Joshua, Amelia knows that their relationship is not going to get any easier. She’s a ghost, he’s 100% alive. He will age, she will not. Though they can touch each other, there’s that pesky problem where Amelia just disappears when they get too close. And there’s those weird dreams she’s been having, though, technically, she doesn’t sleep. Amelia knows that it’s just a matter of time before the dark spirits try to get her again. So when Eli projects himself on High Bridge and tells her the spirits will stop at nothing – including killing everyone she cares about – to make Amelia help them, she knows she has no choice but to leave Wilburton. And Joshua. Ruth, Joshua’s Seer grandmother, has left and returned to New Orleans. The entire Mayhew family is driving from Oklahoma to the French Quarter to visit Ruth and the rest of the family for Christmas. Amelia will travel with them to get away from Oklahoma and then she will decide where to go next. But when they arrive, Amelia is floored to learn that Joshua’s cousins hear her…and their friend Alex? He can see her. Unlike other Seers, they don’t have any desire to exorcise Amelia; they want to help her. Then cousin Annabelle directs Joshua to take Amelia to a local voodoo shop to help her with her visions and bad dreams. There they meet Gabrielle who says she can help her. But after a crazy ceremony in a spooky graveyard, Amelia starts to feel strange. Then Gaby lets her in on a little secret…Amelia is now undead and, when she wants to be, visible to the living. Not exactly alive, but able to touch objects, change her clothes and hear a faux heartbeat. The only problem is now no living person can touch her. Including Joshua. Why is she having these strange hallucinations with warnings about the demons from High Bridge? Did she really hear her father speak to her? Why is Ruth feeling so poorly? Are the ghosts she meets in Jackson Square friends or foes? What is the truth about Gaby and who – or what – she is? And is Amelia truly safe around Alex and the cousins? Best Thang ‘Bout It: A continuation of Hereafter, I am so pleased that the book has a life of its own. Many’s the second volume that has no meat on its bones. Moving the story to New Orleans is brilliant; that great city conjures up visions that are alternately spooky, lively, unearthly, bright and forbidden. Like the home in the Haunted Mansion ride at Disneyland, no? It’s Spanish moss next to JazzFest next to crypts next to chicory coffee. Crypts, Mardis Gras, hurricanes (the storm) and Hurricanes (the beverage). The meeting of other ghosts, the demons looking for Amelia, and Amelia’s change into undead add to the already exciting story. Her decision to leave Joshua in order to save him, and Gaby’s secrets fill the book to the brim. I’m Cranky Because: Secrets, especially between people who should trust each other. Sometimes it’s OK to have them for the sake of the plot, but sometimes they are the only thing holding the plot together. I like it when a book gives up a secret or two, as it would happen in real life. And sometimes, waiting for the other shoe to drop can be very exhausting. Should You? : I shall poke this voodoo doll until you do. 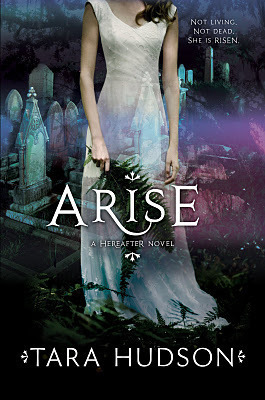 Arise by Tara Hudson was published on June 5, 2012 by HarperTeen. Previous PostReview: ‘Poison Princess’ by Kresley Cole #ATBF12Next PostHaunted Week is Coming! this series has been on my radar so to speak, i am glad to hear book two was enjoyable…hmm maybe i need to grab them! I hadn’t heard of them until the Austin Teen Book Festival. I really liked the twists in them and love that they were in NO for the most recent. I seriously love this series. The plot is pretty good, and I find the characters to be very likable. Also they aren’t ‘predictable,’ which is a big thing for me! Me, too. I agree; there is definitely a thread from the first to second book (which there has to be) but it isn’t a rehash/more of what already happened. I think the change to NO and all of the voodoo was perfect. Thanks for the comment!